In the first of our two RLODC final previews, DEC's Terry Wright looks over Warwickshire's campaign and how they found themselves at Lord's. In sport, as in life, the margins between success and failure can be excruciatingly small. Royal London finalists Warwickshire provide the perfect illustration. With a mere week remaining, their season is poised between triumph and disaster. It’s not easy to say which of their remaining two matches is more important. For sure, a Lord’s final is a highlight of any player’s career and every club wants to win a trophy. But if they lose in their final Championship match to Lancashire, the Bears could well suffer the ignominy of relegation. The truth is, maybe only two wins out of two will suffice to save Warwickshire from the wrath of their sometimes-fickle supporters. Rather like in the T20 Blast two years ago, Warwickshire reached the knockout stages of the Royal London One Day Cup with a late run. They won three out of their last four group games, including a vital victory over Yorkshire in the final match. The quarter and semi finals were played at Edgbaston on worn pitches that took spin. 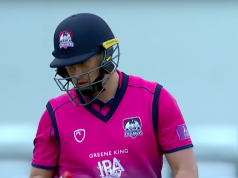 In the quarters, the Bears dispatched Essex with some ease thanks to a hundred from Jonathan Trott and pressure from the three spinners, Jeetan Patel, Josh Poysden and Ateeq Javid, who shared eight wickets between them. The semi-final against Somerset, though a much closer game, followed a similar pattern. This time it was Ian Bell and Sam Hain who supplied the bulk of the runs. Jeetan Patel squeezed the life out of the Somerset innings with five wickets, all lbw. And so, by a tight margin of just eight runs, the Bears booked their trip to Lord’s. Jonathan Trott has had an outstanding tournament for the Bears. With three hundreds and one fifty in six innings, he averages a lofty 72.16, scored at the pretty healthy rate of 87 runs per 100 balls. His ability to hold the innings together and to pace the team towards a winning total has been a vital factor in the Bears’ success. Young Sam Hain has struggled in the four-day game this year. But he has emerged as a force to be reckoned with in white ball cricket. Over 500 runs in the Royal London competition at an average of 66 is evidence of his growing range of wristy, well-placed strokes all round the wicket. Rikki Clarke and Jeetan Patel have shared the bowling honours for the Bears, with 33 wickets between them in the competition so far. At least as telling, is the fact that their combined economy rate is under five runs per over. Clarke is bowling as well as he has ever done and will undoubtedly be keen to get one over on his old Surrey team. As for Jeetan Patel, the battle of the off-spinning veterans between him and Gareth Batty could be key in deciding the destiny of the trophy. Excellent though Batty has been this season, those who saw Patel’s momentous effort in the semi-final are unlikely to bet against him. Warwickshire welcome Chris Woakes back to their squad. They will be hoping that he brings his England form with him. Otherwise, they are unlikely to make too many changes from their semi-final line-up. The key question may well be whether the pitch conditions will justify three spinners. If not, leg spinner Josh Poysden may be the unlucky man to miss out.